The 71st annual Festival de Cannes wrapped this past weekend, May 19, and all in all, film critics decreed it was a somewhat disappointing lightweight year for both heavyweight films – and heavyweight star presence on the Croisette. Part of that is that Netflix dropped out, partly because many of the biggest stars are now working in television. And of course, part of it is that the French love to complain – and have matured into experts in the art of disappointment. However, as far as fashion’s concerned, it might have been Cannes’ best year ever. 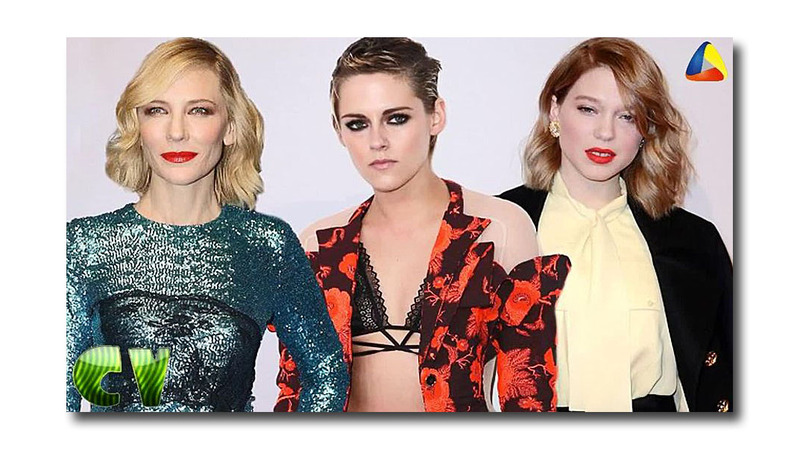 And how could it fail, with Cate Blanchett as jury president, Kristen Stewart as a juror – and representative of Chanel – and Lea Seydoux, another star juror, a face – and body – of Louis Vuitton. For her first photocall at Cannes – a daytime opportunity for the paparazzi to go crazy and earn a buck or two – she wore one of the Duchess of Sussex’s favorite designers: Stella McCartney. How drop dead chic of Cate to don a suit – a masculine tailored affair, representative as her authority as Jury President – and pink, the most feminine color of all. Check out that nipped waist – it looks shaped like the famed Dior Bar jacket. And to femme it up, even more, she chose Stella stilettos in a slightly darker tone. I love the layered necklaces in the décolletage. And the hair and light makeup add to the feminine factor. She makes a tight dress look demode’. Cate started off her many red carpet Cannes sojourns up the Palais steps by recycling the black intricate lace Armani Prive’ she wore when she picked up her Golden Globe f(for Blue Jasmine). Interesting idea to pull off at Cannes – and on opening night, of all things. Sure, it shows a concern for ecology related to fashion – but that ’s contradicted by all the new couture clothes the nights she wore after. No? Yes? Oh, well, who cares? It was an excellent effort, a lovely dress, and it shows a trend a lot of actresses (and Catherine Middleton) to recycle high fashion. Cate was running to screenings every day – she had to see every film. But of course, she was aware of being photographed wherever she went – and she and stylist Elizabeth Stewart were well prepared. This Loewe suit (she’s got a suit fetish – very modern – and her character in the upcoming Oceans 8 wears a lot of suits) is from the F/W 2018 collection (this lady loves a lookbook!). Black viscose wool with ghost-like piping – a kind of weird fabric for a suit, which is what makes it so chic. This is a real standout look – it’s not quiet – but Cate’s significant presence – quiet and still as it is – is never overshadowed by her clothes. Eye-catching as they are. For the May 10th premiere of the film Cold War, Cate absolutely outdid every splendiferous thing she has ever worn – and showed up in this Lacroix-like asymmetrical high/low hem pouf dress in the most exquisite fabric, by Mary Katrantzou. It was seriously one of those breath-stopping fashion moments we all live for – and rarely get (Cardi B isn't going to cut it.) It took Katrantzou six months to construct the dress – three weeks were spent just on applying beading and crystals. It’s an adaptation of several of the British Katrantzou’s S/S 18 looks: a paint by numbers print, a black and white print and the floral that’s splashed over the skirt. 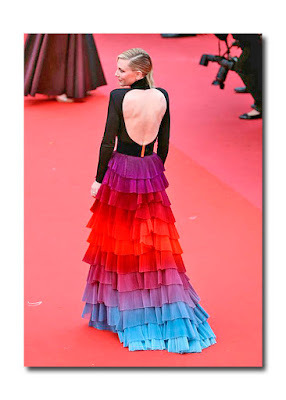 I Instagrammed it, calling it Best Cannes Dress Ever – and got a lot of likes and agreements. Having covered many a red carpet gown/dress for the last twenty years for the likes of WWD, W, Bazaar, DailyFrontRow and The Hollywood Reporter, I’d have to say – it’s my favorite red carpet dress of all time. That includes Nicole Kidman’s chinoiserie Dior Oscar gown by Galliano, Uma Thurman’s violet Prada gown, and even iconic gowns by Audrey and Grace. On May 12, Cate donned another black Armani Prive’ – and we know she and Giorgio Armani are longtime friends since he designed her clothes for Hannah. This gown is striking in its shape, satin fabrication, bow waist, for its one shoulder swirl – and for Cate’s fabulous shoulders. Her skin’s so pale it sheens, high contrast to the black. Note the awesome earrings. And boy, her glam squad knows how to make hair and makeup work with a gown. For the May 14th premiere of Spike Lee’s Blackkklansman (which took one of Cannes’ top prizes), Cate switched to Givenchy – Claire Waight Keller being another one of Duchess Meghan’s favorite (wedding) designers. It’s haute couture from S/S18, and after the Katrantzou, it’s my favorite look of her amazing Cannes wardrobe. Two pieces, it’s a fine silk black top with an open back, and a tiered skirt in what Givenchy called “Mystères d'un Jardin de Nuit" hand painted degrade’ in fully pleated organza, with a black velvet belt. Love a two-piece evening look – and that skirt is so festive, has such excellent color contrast –a simple piece with an elaborate rainbow fluffy one. Perfection. For the May 15th Trophee Chopard, it was Giorgio Armani Prive’ again, a perfect white silk stark gown. Reminds us a little of Meghan’s McCartney wedding column. Only slender women can pull this silhouette off – though Kim Kardashian would not agree. Okay, how killer is this? On May 17th, it was Givenchy Haute Couture again, a S/S18 look of a black 3-D bustier of pleated bonded plumetis (meaning: fabric with raised dots) and silk tulle, paired with flared shiny wool pin-striped trousers and a black velvet belt. Doesn’t this look like something Emma Stone would wear? It’s so modern and youthful – and surprising. Emma would do a much simpler version – Cate goes for the frouf here – and contrasts it with chic trousers. All the looks are diverse from each other – and unusual designers thrown in, like Loewe and Katrantzou. It would seem that it has no continuity – but its throughline is Cate’s almost throwaway chic –she wears every look like it’s her athleisurewear. As I’ve always said – she wears the dress (or trousers) – it doesn’t wear her. Better than anybody.